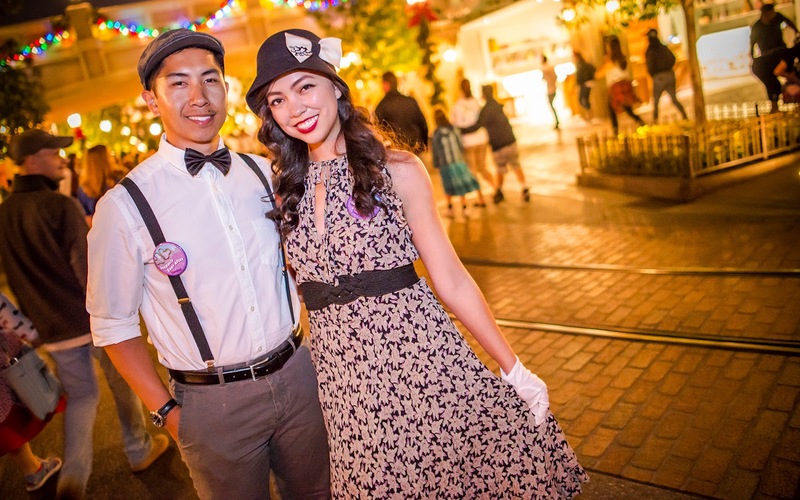 This past Sunday was Fall Dapper Day at the Disneyland Resort. Once again, Disney fans of all ages and backgrounds arrived at the Happiest Resort on Earth dressed in elegant, creative, dashing wardrobe. Some came Disney Bounding in palettes reminiscent of well known (and some not as well known) Disney characters. Others went for styles of the Golden Age of glamour, typically from the 1920's, 30's, or 40's. 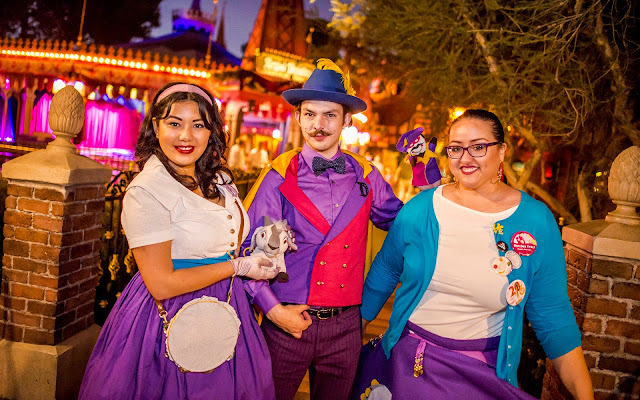 And others chose to dress up just in general, donning stylish dresses and handsome suits to reflect the ultimate goal of Dapper Day--to recall a bygone era, back during the mid-20th century, when families dressed up on their trips to the park and create an atmosphere of special occasion. Here is the first of several Dapper Day posts I'll be making for this past weekend's festivities. 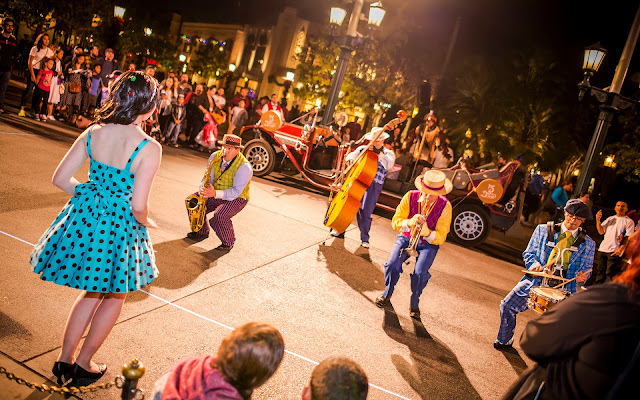 This one focuses on evening photos that I took while walking around Disneyland and Disney California Adventure. 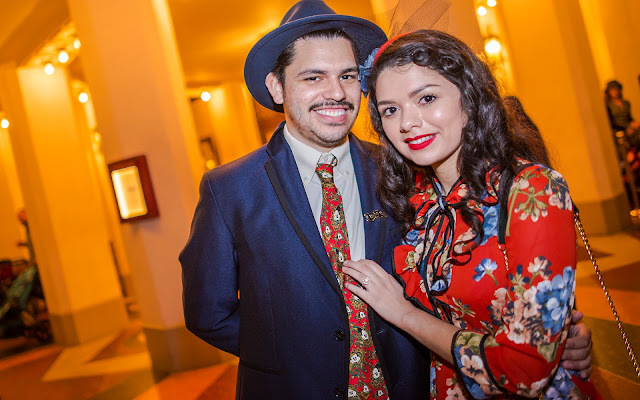 There were so many people in wonderful outfits everywhere, and this selection is by no means a judgment of the best or most creative or most elaborate. 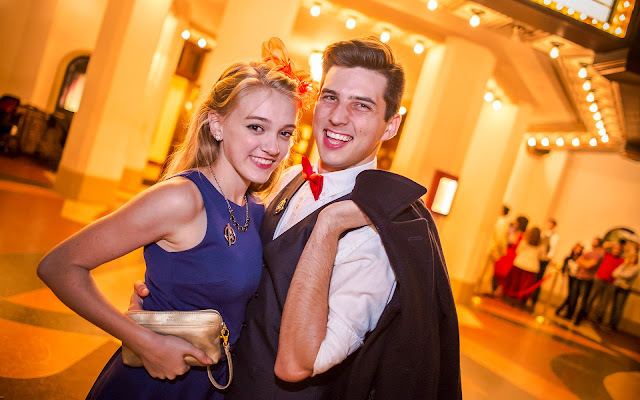 These just happen to be people I ran into, conveniently asked for photos, and who agreed. 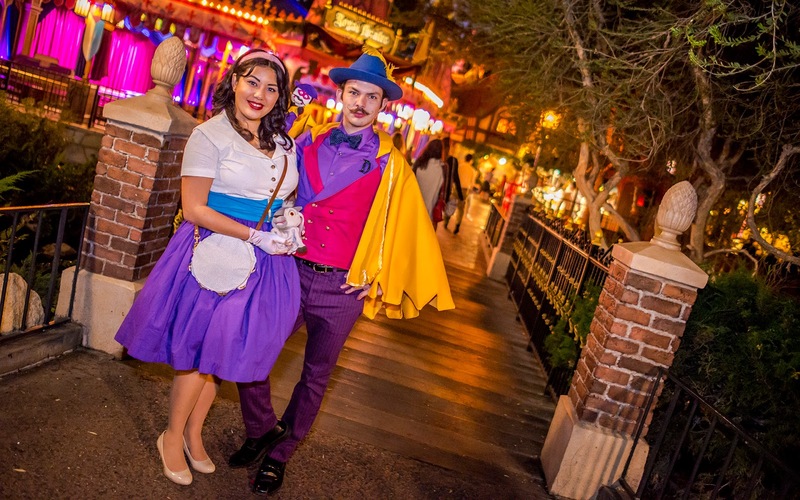 In Fantasy Faire, this lovely couple came Disney Bounding as The Hunchback of Notre Dame's Clopin and Esmeralda. 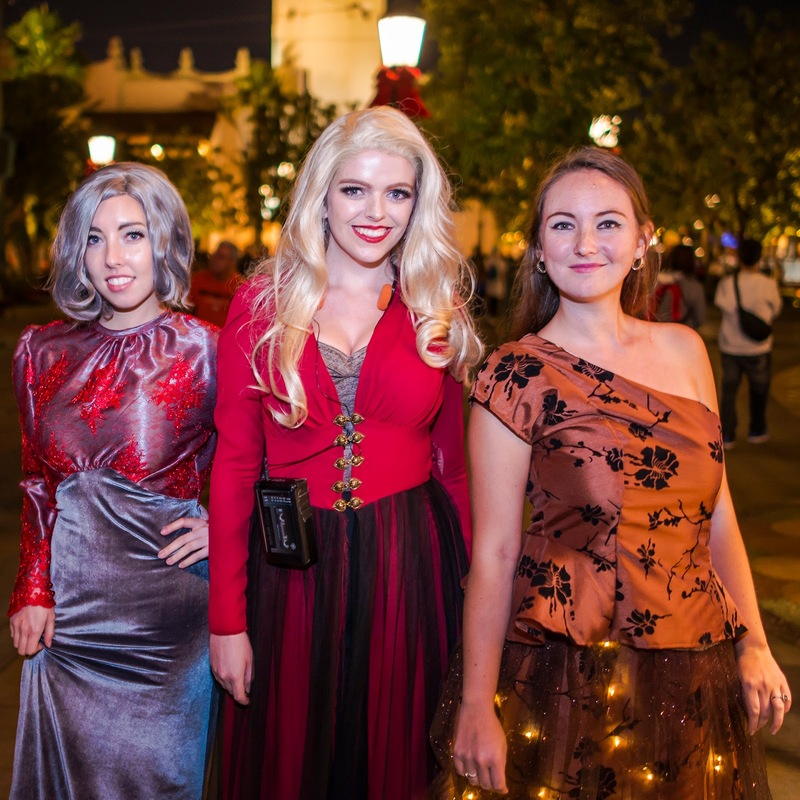 Don't see a lot of Hunchback guest costuming! 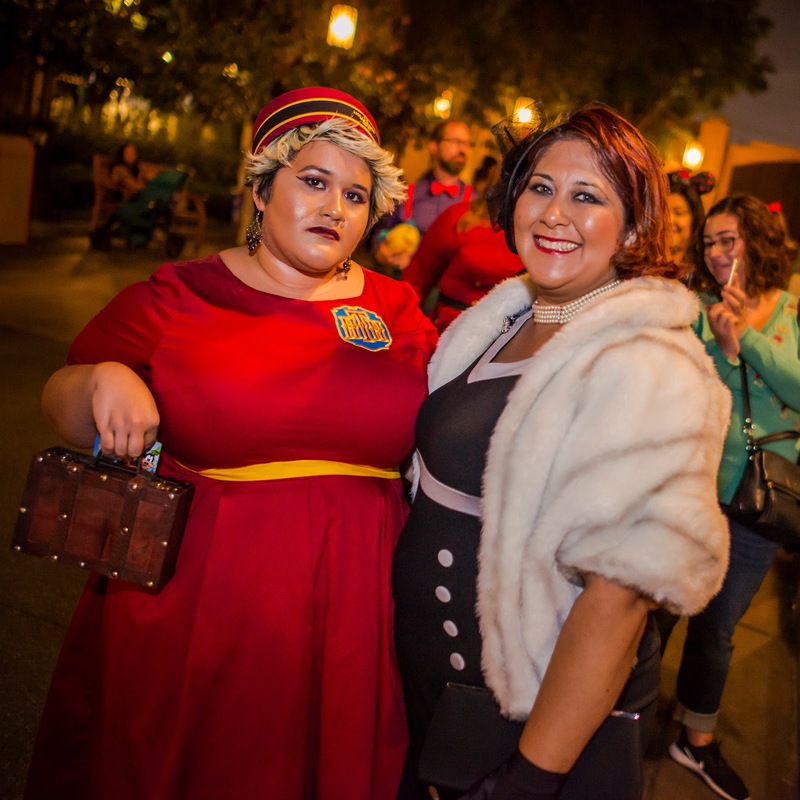 This was a great coincidence, because my friend, Mel, was also Disney Bounding as Esmeralda, and she was thrilled to find birds of a feather. 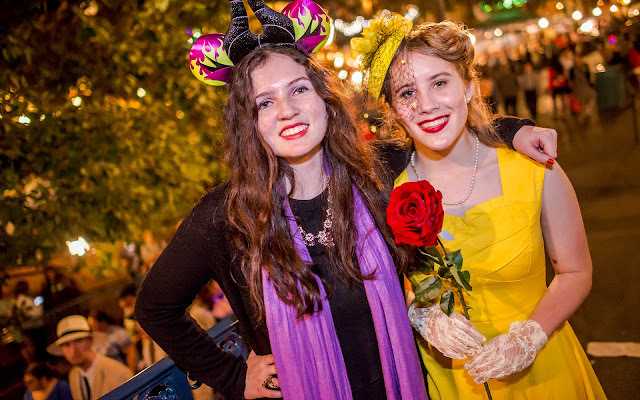 Over by New Orleans Square, I encountered this lovely Disney Bounding duo of Maleficent and Belle. One of the fun parts of Dapper Day has become trying to figure out if someone is just dressed up or actually Disney Bounding as a character or Disney brand name. 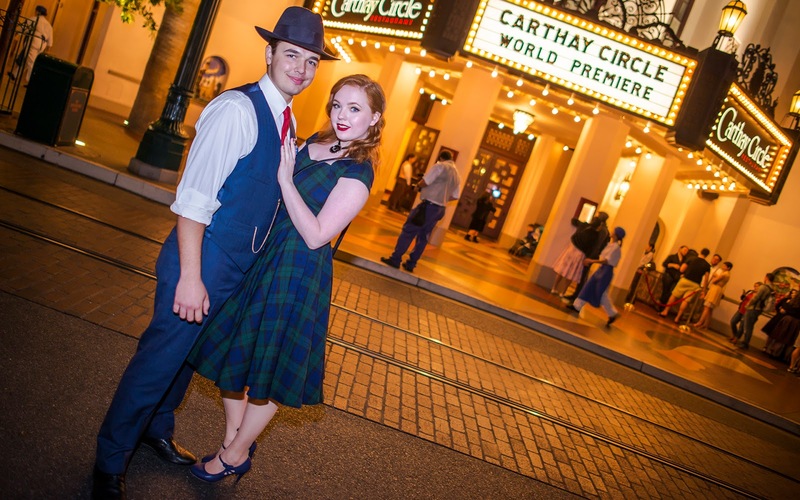 At Carthay Circle, this well dressed gal was dancing along to Five and Dime, who happened to be playing. 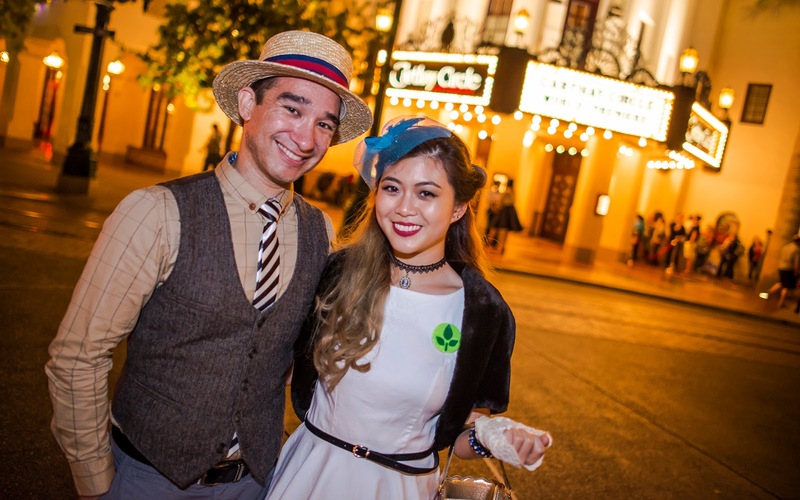 Mary Poppins was a popular theme. 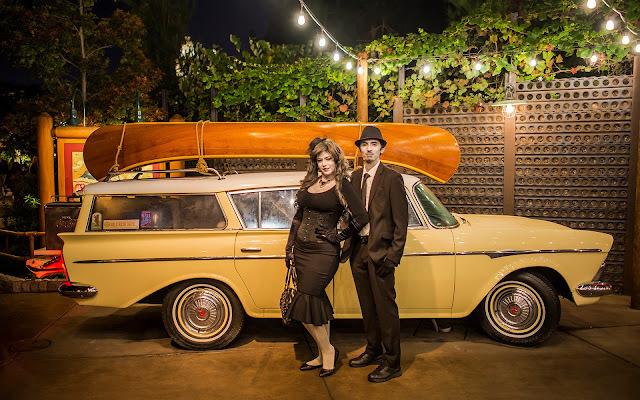 Others preferred to just look fabulous for a night out on the town. 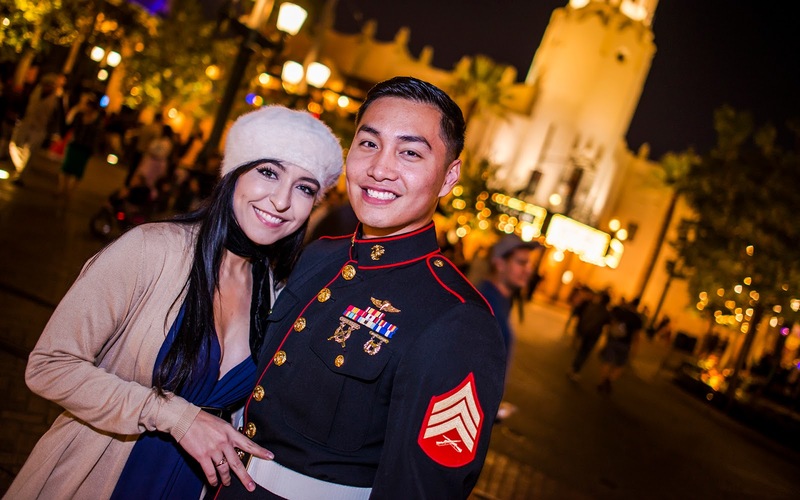 Fittingly, this Tower of Terror bellhop and her companion here were for their last Tower of Terror check-out. 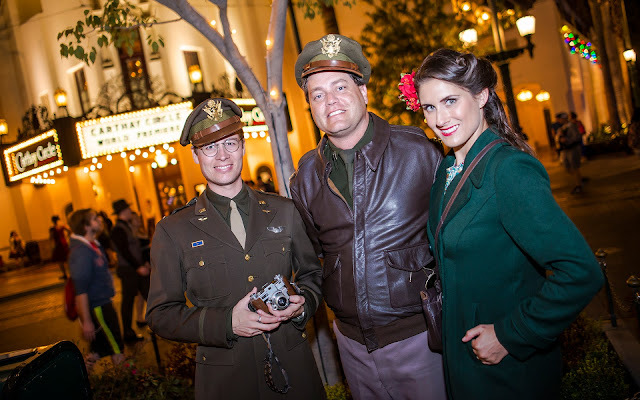 Another couple on a "night out" in Buena Vista Street. Disney Bounding can be subtle, like this Guardians of the Galaxy display (also... light up dress!!!). A subtle Eve from Wall*E? 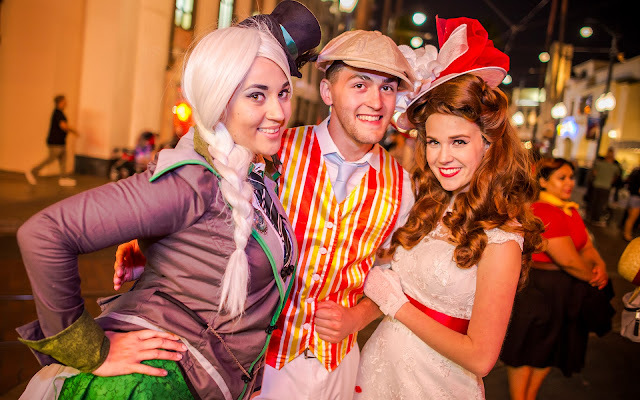 But it's always fantastic to see people dressed up at the parks. It's great to see glitz and glamour translate to the guest side. I wish I had run into this pair in Hollywood Land. They were grayscale Hollywood star and starlet of the literally silver screen! A couple looking quite regal. If this wasn't a theme park, one might think these were actual photos from a fancy evening out! 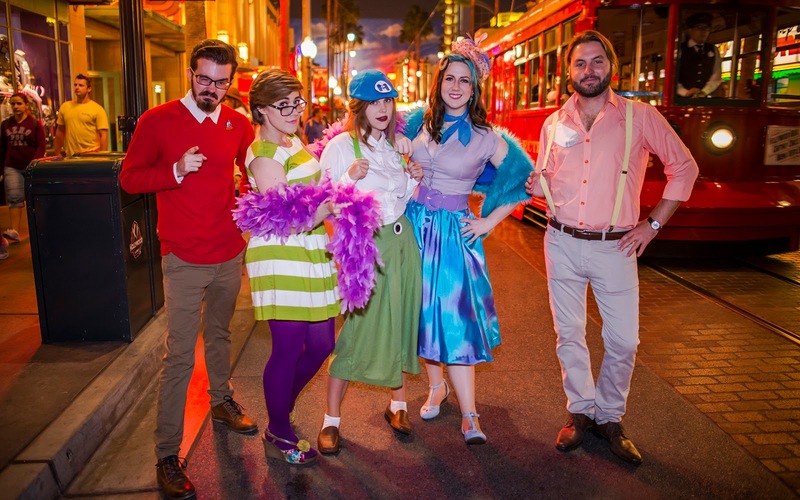 Until the Disney Bounding--like this Monsters Inc./Monsters U ensemble--give it away!